A few weeks ago, I harvested the last rhubarb of the summer. In a semi-insane moment of inspiration and ambition, I decided to try a Martha Stewart recipe for a lemon mousse with rhubarb sauce. Each step required significant prep and cooking and chilling. Since I had a busy few days, the whole process took about 72 hours. I would have forgiven her for leading me down this path of self-immolation had it been the most delicious dessert I had ever tasted. Sadly, it was a big disappointment. The lemon mousse smelled great but wasn’t sweet enough on its own. The rhubarb added too much stringy texture to the sauce. (Why on earth did I believe her when she said to leave it in 2-inch pieces?) And while it looked like heaven on a plate, I could have saved myself a lot of time and headache – not to mention rhubarb – and simply driven to Handel’s or Heavenly Cupcakes for a much yummier dessert. 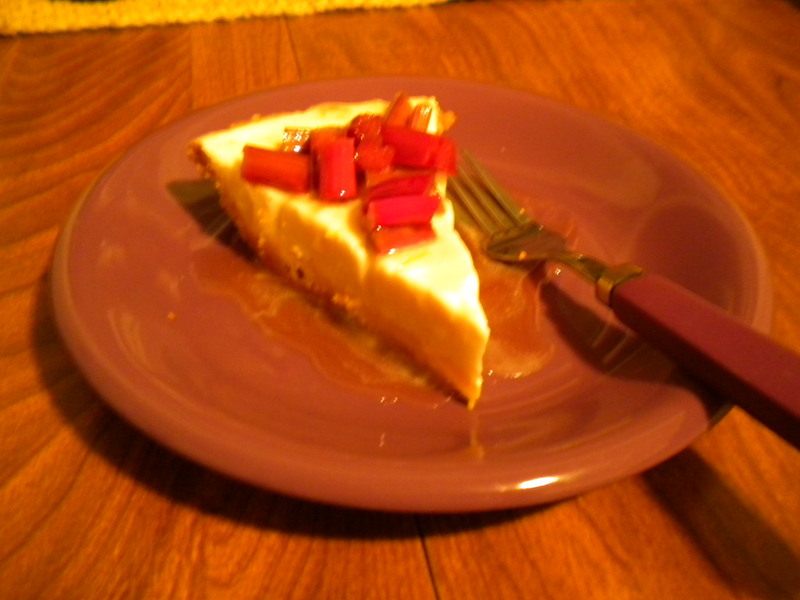 So there I was, with a pan full of rhubarb sauce in the refrigerator, taunting me for the failure. That’s when I decided to wrest control of my kitchen back from Martha and create my own dish. The idea was simple. 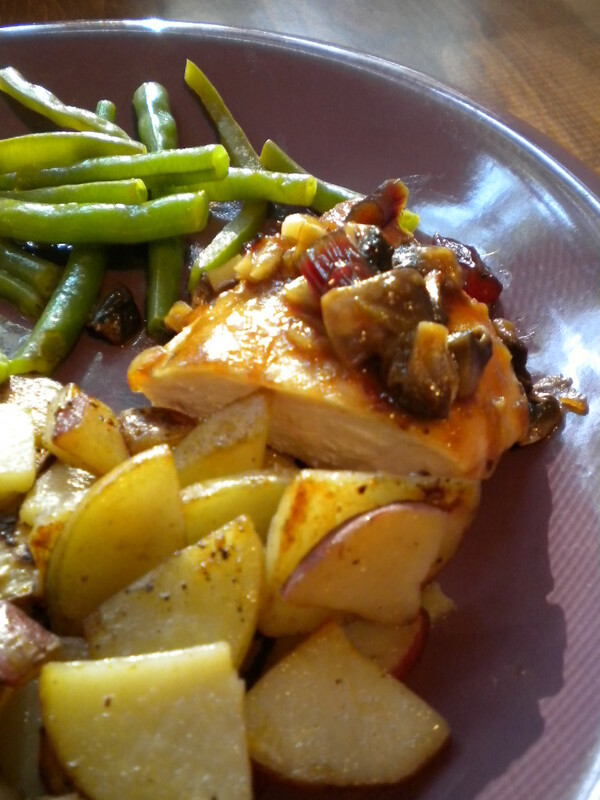 If raspberry chicken could be delicious, surely I could accomplish a similar feat with rhubarb! I heated some olive oil, browned chicken, and proceeded to doctor the sauce for a half hour of slow cooking. A splash of balsamic to cut the sweetness, a cup of vegetable broth added gradually and cooked off, onion, garlic, and mushrooms all found their way into the pan. The result? A moist, delicious, sweet-glazed chicken breast. The rhubarb did not die in vain! And the meal was rounded out with green beans with green peppers and the last of Matt’s potatoes. This entry was posted in CSA, Dessert, Dinner on July 21, 2011 by theneighborboys. I do have to say the chicken was so tender and the sauce was superb. The dessert was okay but, yea, it took too long and was just okay. Yummy dinner overall and fr dessert we had heavenly cupcakes – yeeeeeaaaaa! Oh Tom, how sad your dessert story ended. Glad the chicken turned out so it was not a total loss. I love my Martha (just ask Kim). So unhappy it was her recipe. Sandy, ( you know who I mean, not to say her whole name) I could understand if her recipes didn’t work. But, please don’t give up on our Martha. ( And by the way, I have a signed cookbook from Martha that says, Merry Christmas Beth , From Martha in red pen . Laura’s friends witnessed her signing it. So, we do have a special relationship. :))Although , I still feel your pain for all the time in the kitchen! Don’t worry, Beth, I still love my Martha. (For one thing, the gay mafia would threaten me if I said otherwise.) She was in Minneapolis on her book signing tour when I still worked at Barnes & Noble, so she signed a bunch of copies of her book as Christmas gifts for my family members. We also got to chat for a few minutes, which was very neat! I usually enjoy her recipes too, but sometimes…well, let’s face it, she’s just nuts. And I was nuts not to spot it in advance with this dish. Still, something good came from it in the end. Beth will tell you I am not a fan of the M word. Oh God I said it out loud!! So I will behave myself but off line I will have a few things to say. Nice to see a good save with the precious rhubarb. I am liking the though of rhubarb chicken. Hats off to the real chef today! Feelin’ the love for Martha. You got to talk to her Tom? Lucky you! Yes, she can be you know, Martha. But, isn’t that why we love her? And, she can pull off a poncho! She is on the Hallmark Channel now you know. I love her and when I am sick in bed , I read my Martha magazines and somehow, I feel better. Those pictures…you must stop me know ..Hey Kim are reading this? Oh my goodness, I am truly sorry about the culinary adventure and being misled by Martha, but I just woke up and it was such a good story! Thanks Tom! And I am so glad that you saved the sauce so the story had a happy ending too! I also can’t help but observe that your photos have become spectacular! What are you doing? I told Care she needed to read your entry last night I knew she would love it. IT could be a great short story and yes the photos are looking good! I love the Martha bean bag toss back and forth. If she inspired such a great dinner, it’s all good with me. You know when you have to wait close to three days or a dessert it just gets so hyped up……it was okay but I agree with Tom., not worth the time. I didn’t mean to inspire a Martha maelstrom. I somehow manage to balance being a fan with thinking she was a bit of an idiot for her illegal stock trading activities, admiring the lifestyle while laughing at some of the more outrageous extremes. So I try to take the best and ignore the rest! I love Martha, but have only had terrible luck with her recipes. She can tell me how to decoupage an Easter egg any day, but I leave the fooding to Alton, Bittmann, and Beranbaum. Nothing you all can say will change my mind. I am still hopelessly devoted to Martha! One year , I followed her Halloween pumpkin idea. I drilled holes all around a pumpkin with Bob’s drill and stuck white Christmas lights in each whole. It looked like a disco ball. It was a hit. Another year, Care, you’ll remember this, I cut bare branches and put them above our sliding door and strung white lights on them. Yes, that was all Martha. Easy , cheap and dramatic. I could go on and on!